Sorrento is known for producing lemons and oranges; be sure to try any food or drink derived from these fruits, including the famed Italian liquor limoncello. Sorrento is home to famous Easter parades if your visit coincides with this holiday. It is possible to take a dip in the natural thermal waters during your visit. Extensive celebrations take over the streets of Sorrento during the Christmas season. Over the years, Sorrento has earned a reputation as a starting point for exploring a number of nearby attractions. Many visitors are discovering that Sorrento is an appealing destination in itself. Beyond the stunning façade, there are many things to do in Sorrento, including visiting local museums, monasteries, and frescoed churches. First and foremost, Sorrento is a city of pleasure, where slowing down for a leisurely meal is just as rewarding as a day spent sightseeing. There are many historic inns, family-owned restaurants, and local bars for sampling authentic cuisine and Italian wines. Sorrento is a coastal city, and has many options for boat tours and fishing trips for those who want to gain a different perspective of the city. It is also a great place to hop on a ferry from, whether you just want to see the town from the water or go to one of the ferry destinations, from Naples to Ischia to Amalfi. There are also many museums worth visiting, including the Museo Correale, the Mineralogy Museum, and the Museum of Villa Fondi. Like many other Italian destinations, some of the best places to go are churches and monasteries. In Sorrento, visitors will want to see the frescoed Chapel of Santa Lucia and the cloisters of San Francesco. The beauty of Sorrento is just the beginning of what you can discover in this region of Italy. Sorrento is a popular starting point for venturing into other cities in this part of the country. 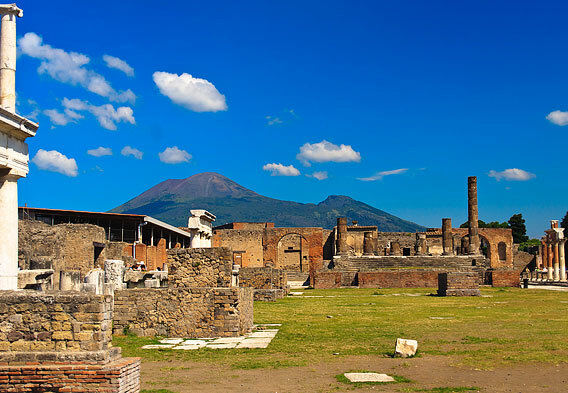 One of the most fascinating local historical attractions is the historic ruins at Pompeii. Here visitors can discover an ancient city that was frozen in time by the eruption of nearby Mt. Vesuvius. Directly connected to Sorrento by train line, be sure to plan an entire day of your itinerary to explore the ruins at Pompeii. Also be prepared to explore on foot; this ancient city is quite large. If you are interested in the glamorous side of Italian culture, you will want to plan a trip to the chic island of Capri, known for soaring cliffs, designer shopping, and boat tours. 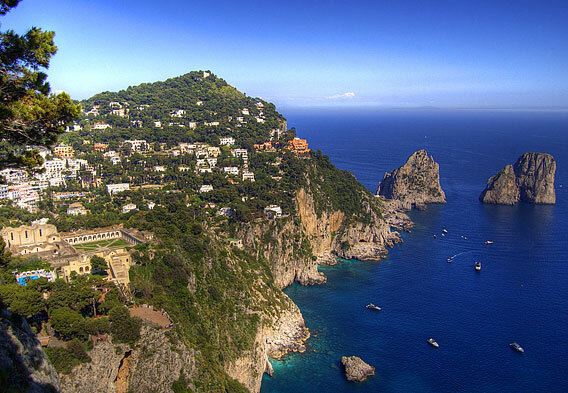 To reach Capri, most visitors will board a ferry from the port in Sorrento over to the island. Once you reach the harbor, a funicular (or cliff railway) will bring you up into the main center of Capri. There are a few popular attractions on the island, including the famous Faraglioni rocks and shops in the town of Anacapri. Don’t forget to try the Caprese salad in the place where it originates. There are also many beaches on the mainland for soaking up some signature Italian sunshine. However, visitors should beware that most of this coastline offers rocky, pebbly beaches, and not expanses of white sand. It is characteristic of the Mediterranean Coast to offer beaches with incredible views and great swimming, all they lack are the sugary sands some travelers might be used to. Regardless, pack a picnic and explore the beaches near Sorrento, including Vico Equense. 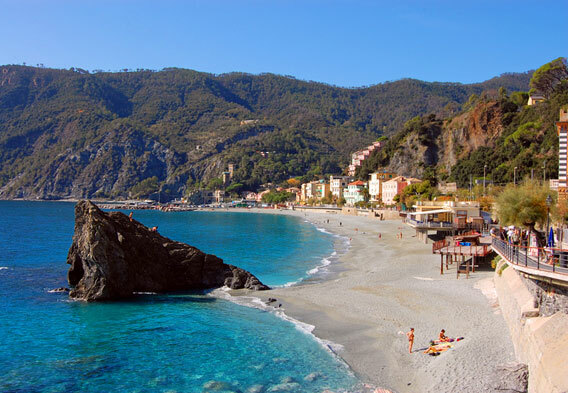 Other nearby beaches include those in Positano, Amalfi, and Nerano.